It's the perennial problem facing all hobby cidermakers, a bottle shortage. You need several hundred empty bottles in short order, and no matter how many you save there never seem to be enough. 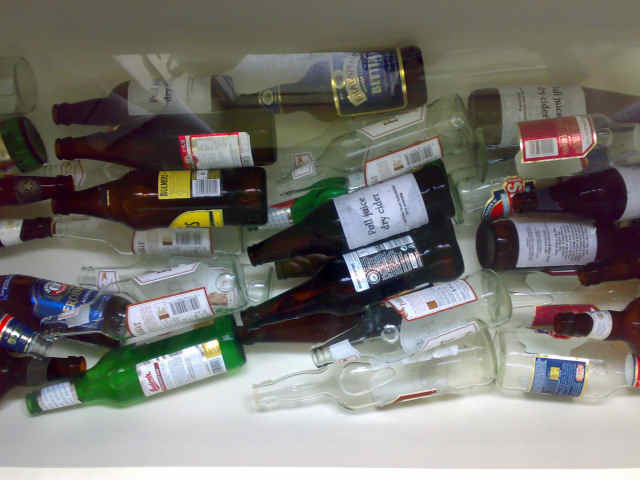 I am very fortunate, I have one or two lovely friends and colleagues who save their bottles for me. Yesterday as I soaked the labels off some of those donations I had cause to consider the issue of bottle donations, both good and bad. You see, I am quite frequently offered bottles. But despite my need for them I have learned to treat offers with caution. It's a "Something for nothing" thing. There is a certain type of person who once they learn you are a cider maker seems to think that giving you some bottles that they would otherwise pitch in the recycling entitles them to a lifetimes supply of free cider as well as the right to deliver frequent lectures from an expert perspective on the subject of "Scrumpy" and what an "Authentic" cider should be. The bottles are rarely rinsed so you receive a bag of festering beery remnants, each with its own mother lode of bacteria and moulds to contaminate your precious pressing, each of which must be carefully washed to remove all residue. You would be amazed how tenacious dried-on beer residue can be. And for this you are expected to give them the same amount of bottles back, full of cider. Here's a suggestion, try offering that deal to Magners, Westons, or Bulmers, and see how far it gets you. So how about this. If you have a friend who makes cider as a hobby, offer them your used crown cap bottles and you'll probably get some bottles of cider in return. But if you really want to retain them as a friend, rinse the bottles out when you've drunk the beer, OK?